EMCEL HEPA filters can be manufactured as replacements to match existing filters or to meet new design requirements. Caseworks can be fabricated from galvanised steel, aluminium, painted mild steel, stainless steel or PVC but other materials such as MDF (for incineration disposal) can be specified. Protective meshes can be fitted to both faces and gaskets can be fitted to each face if requested. Close pleated packs are normally moulded into rigid polyurethane circular end caps or encapsulated within preformed painted mild or stainless steel spinnings. Other materials can be specified. The pleated media can be protected on both faces by mesh screens and sealing gaskets are provided to suit the application. Developed and patented by EMCEL for in-line filters, this system provides excellent sealing properties and can overcome the problems that can arise from progressive decay in structural stability exhibited by flat face seals. The flexible edge seals do not require tightening down to maintain efficiency. 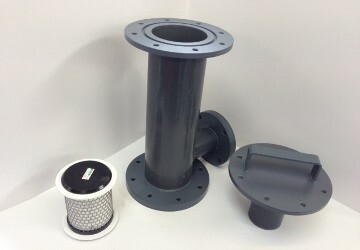 The Leaf Seal System is moulded into the end caps of EMCEL Cylindrical HEPA Filters. Efficiencies of up to 99.997% can be specified with all filters being individually tested and certified to BS 3928 – Sodium Flame test method. DOP testing is also available.